Montego Bay, also referred to as MoBay, is the second largest city in Jamaica. It's also the capital of St. James Parish and is located on the island's north shore. It is one of the most popular tourist destinations on the island and is home to the Sangster International Airport, which is one of the country's two main airports. There are a handful of hostels around the city. Most are small with just a couple of private rooms and one or two dorms. Consider the hostel's location when choosing, as transportation around town can be important. How much do hostels in Montego Bay cost? A good option for couples traveling to Jamaica. Misty Valley is technically not a hostel, but instead a bed and breakfast in Montego Bay, Jamaica. It has the feel of a guesthouse in a family home, and it is a relaxing place to stay. It's located about seven miles west of Sangster Airport and is in the hills about a seven minute drive from the ocean. It's also a ten minute drive from the river where you can raft, tube, zipline, or swim and there's a beautiful hummingbird sanctuary nearby. Misty Valley is a small and intimate place to stay. There are two double rooms and one twin. Each room has its own private bathroom with hot water throughout the day and night. There's an outdoor swimming pool and yoga is offered daily. There's also a small kitchen which guests can use. This bed and breakfast is a wonderful place to stay with a personal feel. You can arrange all kinds of tours with the owner and you'll really get an insider's perspective on the area. It truly can't be beat. Five Gables is another quaint place to stay in Montego Bay. It's located in the quiet suburb of Ironshore, which is known for its villas and vacation homes. It's about a five minute drive from a variety of restaurants and shops, and is ten minutes from the airport. It's also fifteen minutes from downtown Montego Bay. It has a relaxing setting with a private pool that looks out on the garden. The impressive garden is filled with tropical fruit trees and makes a great backdrop. There's also a large veranda that has impressive views of the Caribbean Sea. The hostel also has free wi-fi, laundry facilities, free parking, a book exchange, a common room, and a secure front gate. The staff can help you organize any transportation or tours that you might be interested in as well. There are both private rooms and a dorm available. The dorm sleeps up to six people on three bunk beds and there's a ceiling fan and a nice breeze to keep it cool. The single private room has a full sized bed that sleeps one person. There's also a ceiling fan and a standing fan. The double room is well decorated and has a view of the swimming pool and the Caribbean Sea. It has a queen sized bed and a full sized day bed. There's also a private bathroom and large windows. Togetherness is another popular place to stay in Montego Bay. It's another small and quaint place with a personal feel. From the house you can enjoy views of the Caribbean Sea and the surrounding area. The hostel is small and has a master bedroom, a double bedroom, and a dorm that sleeps up to eight. Every room has its own bathroom as well as access directly to the swimming pool. The hostel staff can help you arrange any transportation you might need. There are taxis that take you to places such as the nearby Blue Diamond and Whitter Village Shopping Plaza where you can pick up food and supplies. 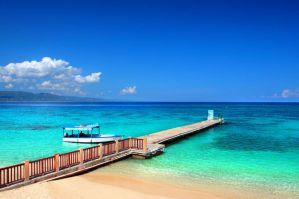 It's also easy to reach several good beaches as well as downtown Montego Bay. A good hostel for solo travelers, backpackers, and couples. The Bird's Nest is one of the more popular places to stay for budget travelers in Montego Bay. It's located in the Ironshore Resort Estate and is about ten minutes from the airport. The hostel is sport themed and is run by enthusiastic kitesurfers who also run the IKO Kitesurf Center about twenty minutes from the hostel. Also nearby are four golf courses, tennis courts, and several great beaches. The hostel has a nice deck that looks out on the Caribbean Sea. There's a beautiful garden that is green and tropical and the setting is relaxed and peaceful. There are both dorms and private rooms available. The private rooms are either singles or doubles and the dorms sleep either four or six people.